View Cart “An Introductory Guide to Anatomy & Physiology 5th Ed” has been added to your cart. SKU: 9780970700612. Category: Yoga. Tags: Anatomy, hatha yoga, yoga, yoga anatomy, yoga student, yoga teacher. 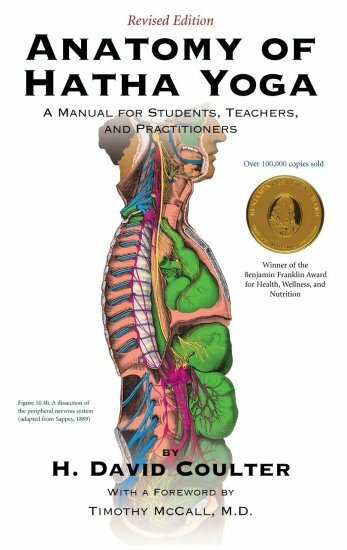 Anatomy of Hatha Yoga now revised and in full four color reproduction, this book remains the most authoritative source correlation the study of hatha yoga with anatomy and physiology. Yoga practitioners, teachers, personal trainers, medical therapists of all kinds, or anyone who is at times curious or troubles about how the body responds to stretching and exercise will find in this book a cornucopia of readable and reliable information. This book has sold over 150,000 copies, was a Benjamin Franklin Award winner for Health Wellness, and Nutrition and spent six years as a retail top 50 selling health hardcover backlist book. H. David Coulter, PhD. practiced yoga for more than thirty years. He was initiated by Swami Veda (formerly Dr. Usharbudh Arya), trained under Swami Rama from 1975-1996, and studied under Pandit Rajmani Tigunait at the Himalayan Institute for more than a decade. Dr. Coulter was also an Anatomy professor at the University of Minnesota for seventeen years. Body and Breath Books are distributed throughout the US and Canada by Cardinal Publishers Group.